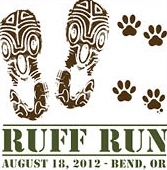 Participating people and dogs will take off in the 2nd annual Ruff Run Aug. 18 at 7am at Riverbend Park in Bend, OR. Proceeds from 5K run/walk benefit DogPac, a nonprofit dedicated to expanding off leash recreation for dogs in the Bend area. Since its inception, DogPac’s successes include increasing from one to seven the number of Bend-area off-leash dog parks, and creating and maintaining Oregon’s only groomed cross-country ski trail that allows dogs. Learn more at DogPac.org. Posted in Fetch and tagged with Events, Walk, Fundraiser, Central Oregon, Off-leash.